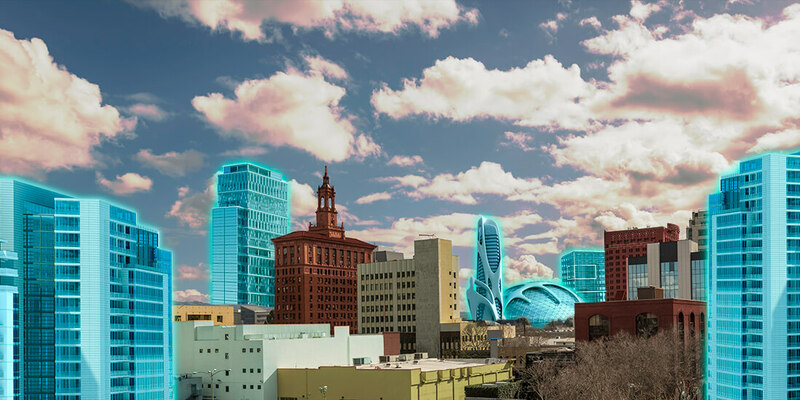 Will a Vibrant New City Skyline Finally Give San Jose a Sense of Space? There's a new emphasis on architecture in San Jose. Image composite: Earl Otsuka. Miami is known for its art-deco aesthetic: simple lines and sleek, white-on-white veneer. New Orleans is adorned with decorative ironwork, gabled roofs, and bright stucco frontages. New York stands out for its sleek skyscrapers, Chicago for its architectural terracotta, and San Francisco for its flamboyant Victorian homes. And then there’s Silicon Valley: Although it’s one of the most significant places in America right now, it somehow feels like no place at all. 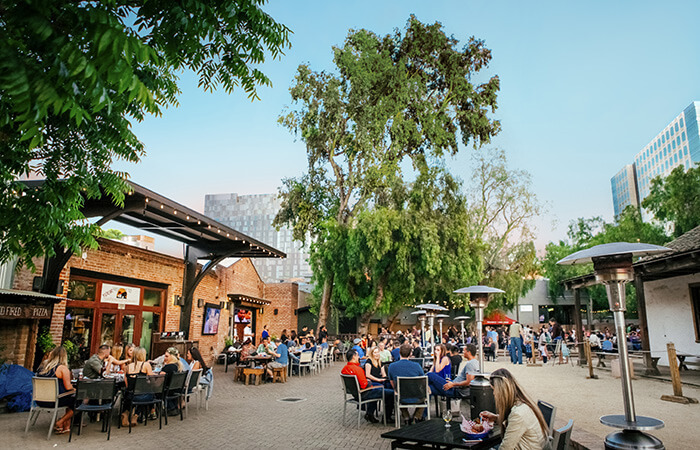 That feeling is especially evident in the valley’s largest city and de facto capital, San Jose, according to Scott Knies, executive director of the San Jose Downtown Association (SJDA), a nonprofit organization working to make downtown San Jose a better place to live, work, and play. The Invicta mixed-use development. Courtesy Steinberg Hart. 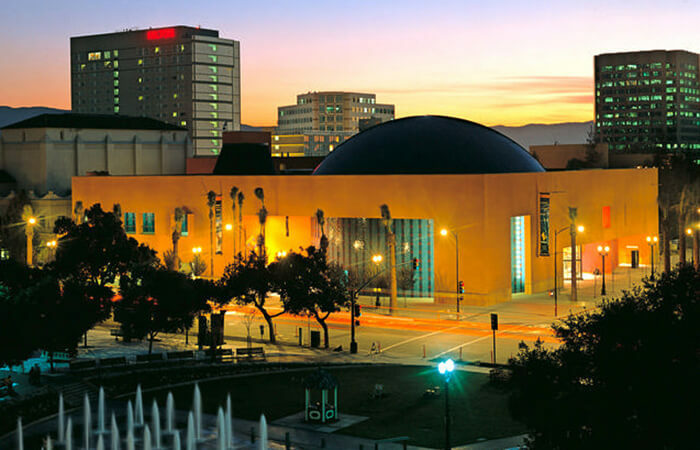 It will take years or even decades for San Jose to feel as singular as other iconic US cities. But pervasive cranes and construction vests foretell a transformation. The past: architectural inconsequence. The future: a city with a signature style and original point of view. Many distinctive downtowns are known for their soaring skylines. For most of its history, however, San Jose has grown out instead of up. One major reason is that its airport’s location, within four miles of the city center, has been the cause of long-held building height legislation in the name of aviation safety. But the airport alone didn’t stunt downtown’s growth. It had help from the entire regional economy, which embraced suburbanism as early as 1938, when Silicon Valley bore its first tech business—Hewlett Packard—in a garage in nearby Palo Alto. Gradually, Silicon Valley became a patchwork of subdivisions, shopping centers, and office parks. Then, in the 1970s, the state-funded San Jose Redevelopment Agency began luring investors downtown with tax-increment financing (TIF). 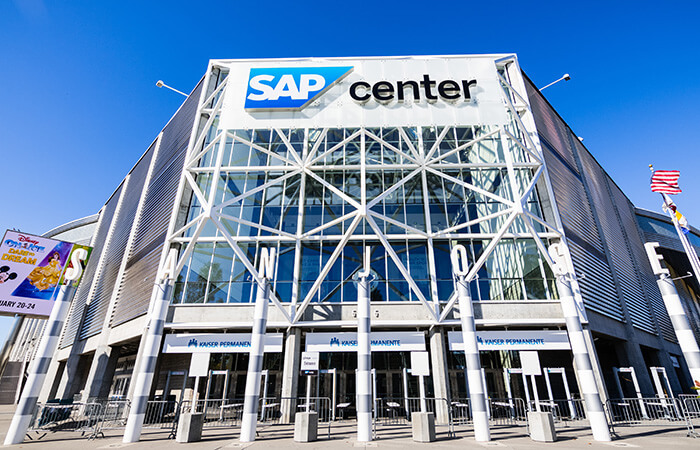 Since then, its efforts have yielded the San Jose McEnery Convention Center, the SAP Center at San Jose, and the Tech Museum of Innovation. Modera San Pedro Square. Courtesy Steinberg Hart. After a slow start, the new paradigm looks promising. The city is sponsoring a massive project expanding its historic downtown train depot, Diridon Station, which will become the largest transportation hub west of the Mississippi River—largely thanks to an expansion of the Bay Area Rapid Transit (BART) train system that will connect San Jose to San Francisco and the East Bay. In turn, Google plans to spend the next two decades building a giant campus around the station with up to eight million square feet of office, residential, and retail space, supporting as many as 20,000 employees. Though it has offices in San Francisco, Los Angeles, San Diego, and Shanghai, Steinberg Hart’s roots are planted firmly in San Jose, where founder Goodwin Steinberg established his shop in 1953. 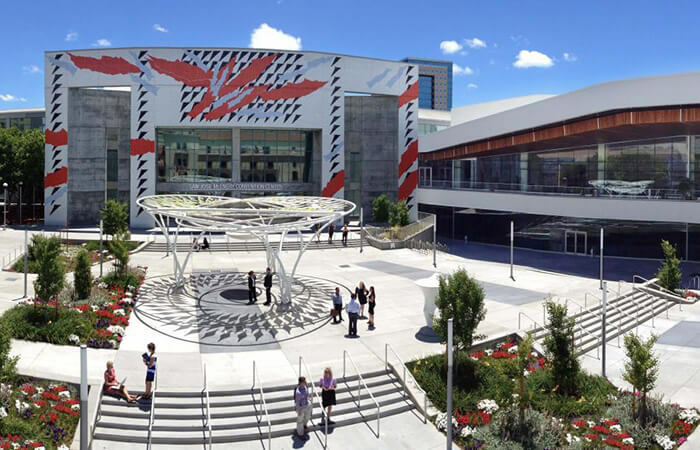 Sixty-six years later, the firm—whose local projects, including collaborations with other global architects, include San Jose City Hall, the Tech Museum of Innovation, the convention center, and the airport—continues to coauthor San Jose’s design story. While it’s not yet clear how that story will end, a trajectory is emerging in the contours of the firm’s current downtown mixed-use projects, which total more than 5.5 million square feet. 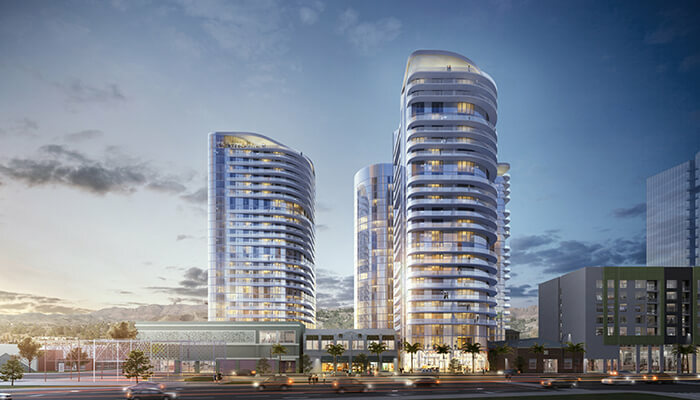 MIRO, a pair of 28-story high-rise mixed-use apartment towers, will be San Jose’s tallest buildings when completed in 2020. Located across from city hall, MIRO will include 630 apartments; 21,000 square feet of retail; and more than 47,000 square feet of amenities. 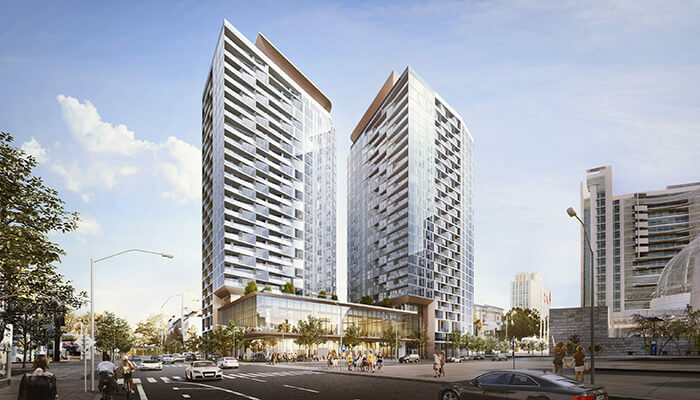 Other mixed-use projects in the works include the eight-story, 201-unit Modera San Pedro Square and Invicta, a mixed-use development offering 667 residential units across three towers that will also include retail, dining, an arts-exhibition space, and a live-performance theater. A market in San Pedro Square. Courtesy San Jose Convention & Visitors Bureau. McEnery Convention Center. Courtesy San Jose Convention & Visitors Bureau. The Tech Museum of Innovation. Courtesy San Jose Convention & Visitors Bureau. Learn how to use BIM to create smart cities and campuses. The projects are also intended to connect to the communities surrounding them. MIRO, for instance, engages directly with East Santa Clara Street, under which the BART extension will run. 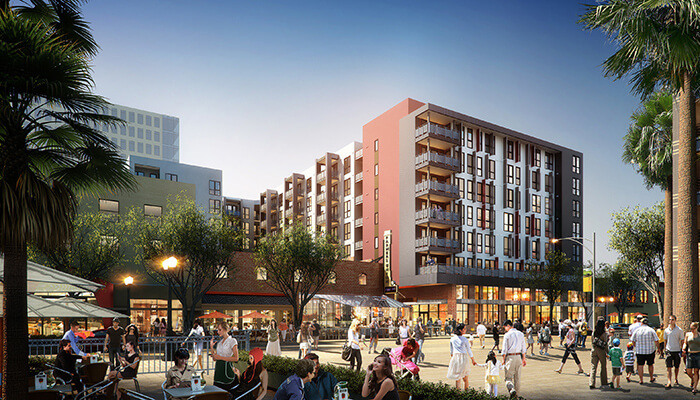 Modera San Pedro Square interfaces with its neighbor, the Tabard Theatre, and Invicta will use its own theater to draw the community in. It’s a long-term strategy: Instead of creating buildings that impose an architectural point of view on San Jose, Steinberg Hart is creating buildings that will catalyze community—the organic outgrowth will hopefully be a unique local culture that over time will shape the city’s aesthetic. The MIRO complex. Courtesy Steinberg Hart. As they wait for a shared palette to come further into focus, Knies and McClain agree: Local talent is the secret weapon that will help San Jose finally realize its own vibe and voice.